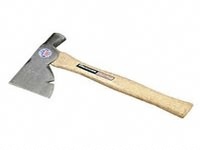 Designed for use as a rugged combination of a hammer and axe. In addition to being used for trimming, cutting, and splitting, the striking face is used for driving nails and stakes. Beveled Nail Slot, Polished Face and Edge, Hickory Handle.